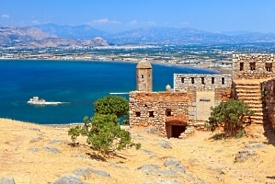 Nafplion, the first capital of modern Greece, is a Peloponnesian seaport town that has expanded up the hillsides near the north end of the Argolic Gulf. Now this historic port is the gateway to Mycenae, one of antiquity's most powerful city-states once ruled by Agamemnon, conqueror of Troy. With its marble pavements, looming castles and incredible architecture, Nafplion is one of the most elegant towns in mainland Greece.